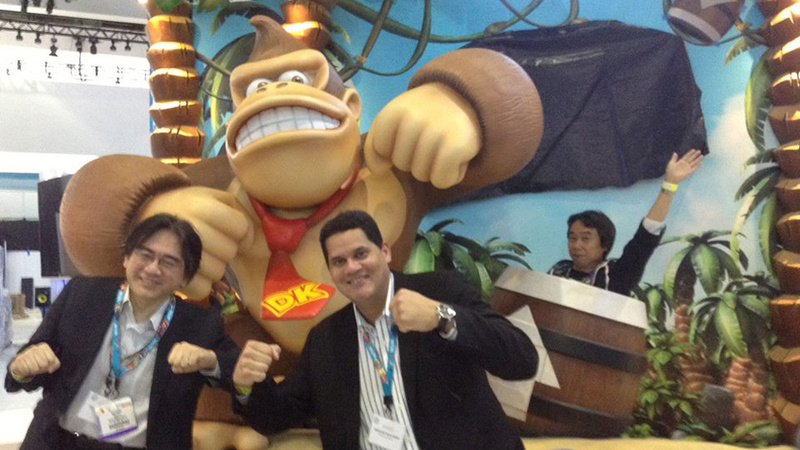 With another E3 coming to an end, we've once again seen Nintendo produce some quirky moments. It must be one of the few multi-billion dollar corporations with executives willing to pose in somewhat bizarre setups, either in front of the obligatory over-sized props or, on occasion, playing a bit of dress up. With that in mind we've decided to collect a few examples, beyond the now traditional arrival in a big car. The eagle-eyed among you will have already spotted this picture on Nintendo Life, but it's absolutely one of our favourites from the show. 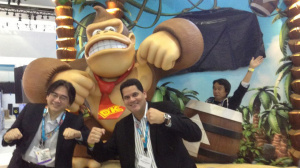 Satoru Iwata and Reggie Fils-Aime are being silly enough, but the wonderful Shigeru Miyamoto, with delicious subtlety, transforms a fun picture into a brilliant one with his antics in the background. Possibly the best image to come out of E3 this year. 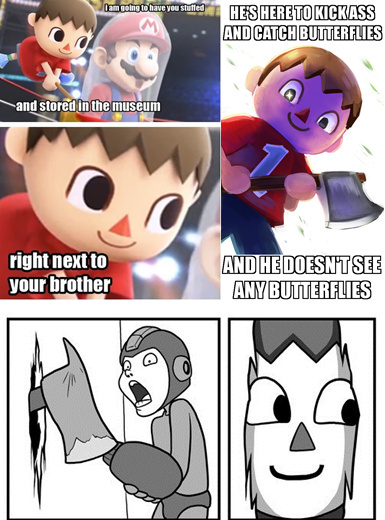 The unveiling of The Villager from the Animal Crossing franchise in Super Smash Bros. came as a surprise. But it seems the internet has decided that the character's impassive, unchanging face — along with the glint in his eye — is likely to be a sociopathic homicidal maniac. He may not look dangerous, but as the montage of memes below shows, some think he is. During a longer video with Nintendo of America's Bill Trinen, Shigeru Miyamoto decided that he would imitate a Bulborb. Classic footage was born. 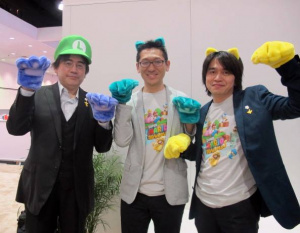 So those are some of out favourite wacky Nintendo moments from this E3, and by all means share yours below. I love the playfulness of these guys. How many other executives do you see wearing cat ears or playing with stuffed animals? That cracked me up. Well done Miyamoto. Miyamoto... What would we do without you? So glad the gaming industry isn't just what you get at Microsoft conference just executives looking at you like money in their pockets after they sell u their next-gen violence. It's lighthearted moments like that, which fit so well with the mood of their wonderful games, that keep us forever enamored with Nintendo. One of the reasons I love this company so much! Miyamoto is the cutest full-grown man on the face of the Earth. Miyamoto is by far the shining light that guides Nintendo. With his child-like play, you know that he is in the right career. A playful genius. ahaha xD Miyamoto you're the best! Iwata is cheating. He chose the Luigi cap instead of wearing cat ears. But yes, it is nice to see them relax a little. Even if it is their business, they don't take games seriously. And yet still deliver some of the best on the market. I guess that passion translates to the games themselves, making them so awesome. @Raylax: I know it's a joke, but Kirby'll probably don the villager's wicked 'do and possibly his snazzy shirt. Mega Man Kirby is like a dream come true. But Wii Fit Trainer Kirby... That'll be something to behold. Just seeing so many developers with those ears and paws is hilarious. This are very lighthearted people. Miyamoto in the barrel is just oh so amazing. @ACK LOL Now I can't take that image from my mind. Miyamoto, the evil Pikmin overlord! I seriously just watched "Don't Attack My Eyes" about 20 times. @ACK Trainer Kirby is not that hard to figure, really white kirby with no eyes. I want Miyamoto saying that while launched in a DK barrel...i'm strange. Nintendo power! Love Iwata and company. Love the picture of Miyamoto in the barrel!